Derek Lobo is the chief executive officer of SVN Rock Advisors Inc., Brokerage, a Burlington, Ont.-based commercial real estate and consulting company with an exclusive focus on the apartment sector. He’s also the founder of the North American New Apartment Construction and Mixed-Use Symposium + Expo. It made sense, then, that Lobo gave a state of the union address at this year’s seventh annual event on June 6 at the Metro Toronto Convention Centre. After about 40 years of relative inactivity, construction of new purpose-built apartments has started again. There are now 160 apartment building applications before the City of Toronto, another 80 in Vancouver, and Lobo estimates there are between 500 and 1,000 across the country. Not all of those will be built, of course, but Lobo was emphatic in stating there’s a big opportunity to build a lot more apartments. After Lobo provided a brief overview, Centurion Asset Management Inc. president, chief executive officer and trustee of the REIT Greg Romundt provided him with a list of topics about the apartment market and let him run with them. Lobo’s company has done hundreds of feasibility studies and studied more than 1,000 apartment sites across Canada, and its biggest clients are condominium developers looking at the apartment market followed by the owners of shopping centres and other properties looking to intensify. Lobo said that condo developers pre-sell, build and then move on to the next project whereas apartment developers are after wealth preservation, tax deferral and cash flow. Lobo said there’s more risk in high-rise construction and that building four 100-unit buildings is generally faster than one 400-unit high-rise. The multiple buildings can also be phased-in to reduce the amount of capital a developer needs to borrow. Lobo said downtown high-rise apartments are the domain of pension funds because they think long term and have enough money to build and purchase buildings without borrowing. 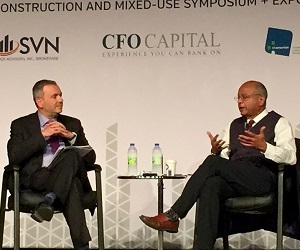 Construction lenders typically lend 75 per cent on a loan to cost ratio, according to Lobo. Developers might also seek mezzanine financing or joint ventures for additional funding. Lobo said if a potential joint venture partner doesn’t bring particular expertise to a project, it’s better to go with mezzanine financing. Such leverage is required for most new apartment construction, except for those built by well-funded institutional investors. “The single largest risk is rent,” said Lobo, who added that he’s seen more people make mistakes by charging rents that are too low as opposed to too high. Lobo said rent is driven by four factors: location, unit design, amenities, and property management platform. Lobo advised not to build on a bad apartment site, even if you own it. It’s best to sell the property and seek one that’s better suited for an apartment. “When we run detailed pro formas, the easiest thing to look at is development yield, which is net operating income over total cost,” said Lobo. Apartments probably have the lowest development yield, but the highest risk-adjusted return, when compared to hotels, retirement homes and self-storage facilities, Lobo added. High land prices in the Greater Toronto Area will start affecting apartment returns, so Lobo said the highest yields can be found where there’s excess land on an existing site which can be intensified by the owner. Older apartments built in the 1950s through the ’70s generally don’t offer much in the way of amenities. New buildings with modern amenities, added as part of intensification, can be made accessible to all of the buildings on the site so owners can raise rents in them as well. Lobo believes mixed-use developments will be a significant part of the real estate industry going forward as some retail, office and limited service suburban hotel operators might have excess land appropriate for apartments or condos. 1. Forgetting to recognize the cost of capital for apartments is lower. 2. It’s not always about jamming the most density on the site. 4. Leasing and property management is a different game. 5. A good retail area isn’t necessarily a good apartment area. 6. Condos and rentals are different. 7. You might need to give up prime retail space for a great rental entrance. 8. The big question is not demand, it’s rent. 9. Phasing-in on larger sites is an important consideration. Most Ontario apartments were built in the 1950s, ‘60s and ‘70s and then their construction stopped in 1975, until a recent reawakening over the past few years, because of rent controls that essentially wiped out merchant builders. Lobo would like to see small developers building apartments of from six to 20 units, and said there would be little lease-up risk for them. “Of the deals that we’ve done, the seller is almost always an entrepreneur developer and the buyer is almost always an institution,” said Lobo. Lobo said incentives typically aren’t offered in locations where everyone wants to be, but can be found in smaller centres as well as in certain areas of larger cities — including Winnipeg, Regina and Hamilton. He stressed that developers shouldn’t build in certain areas solely because incentives are being offered. There must be belief in the market and the site. “So much damage has been done in the Ontario marketplace by rent controls that, quite frankly, we’ve learned to live with it and I think we’re a little numb with it,” said Lobo. He noted demand for apartments isn’t going to go away, so developers and building owners will have to learn to live with legislation.